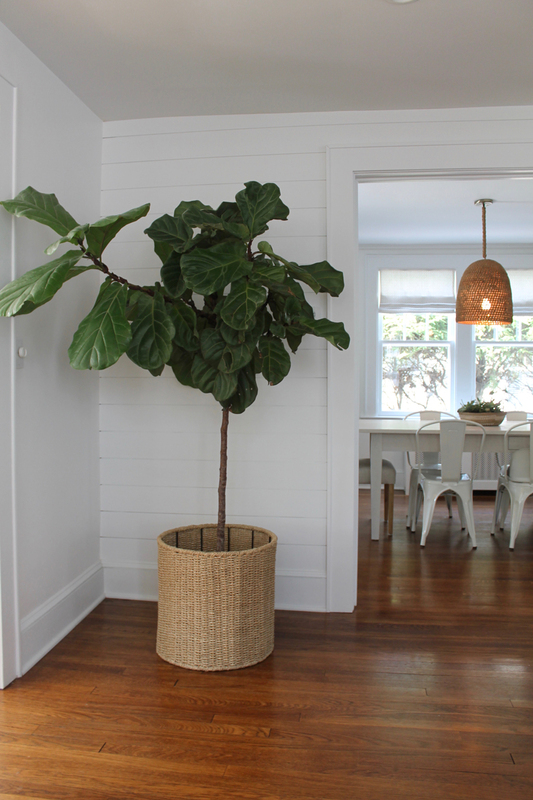 I’m so thrilled to be sharing this home tour with you today. 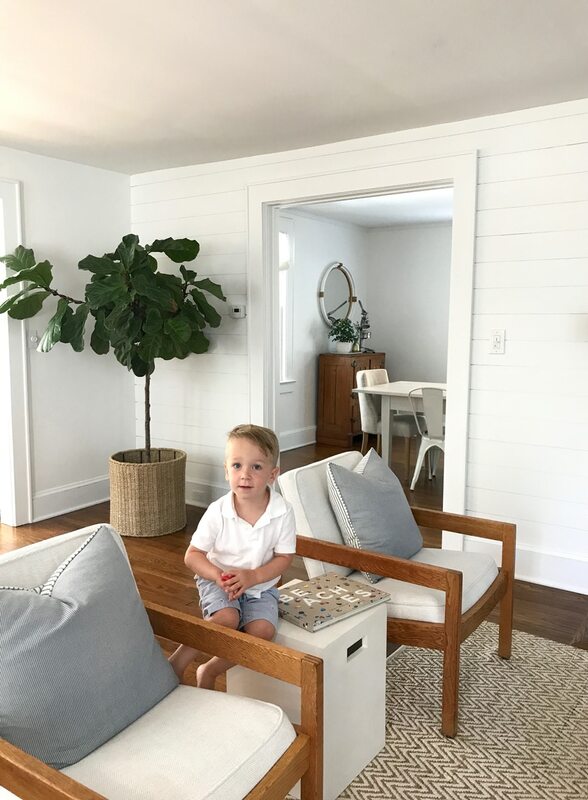 Caitlin and her husband Chris have created a charming modern New England beach cottage for their young family in Fairfield, Connecticut. Caitlin and Chris both grew up in New jersey and began their lives together in Hoboken before making their way to Connecticut. 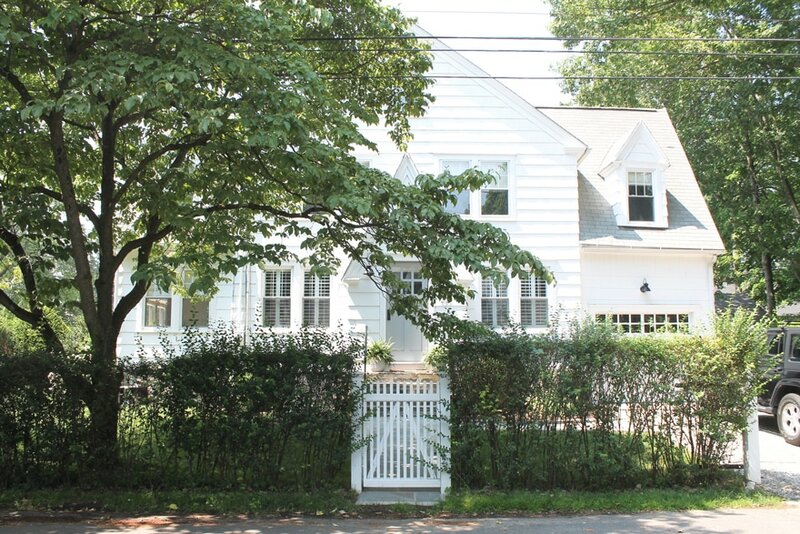 They started in Greenwich and then found a home in Wilton. 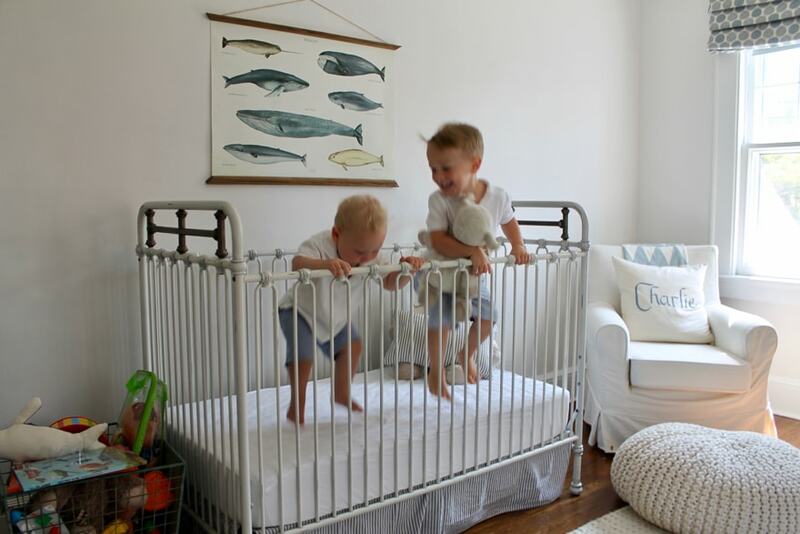 Their first home was quite a project and what inspired Caitlin to start her blog The Picket Fence Projects. She enjoyed sharing and documenting the progress they were making on their first home. With two little ones, you’ll see Caitlin more active on her beautiful Instagram account by the same name. 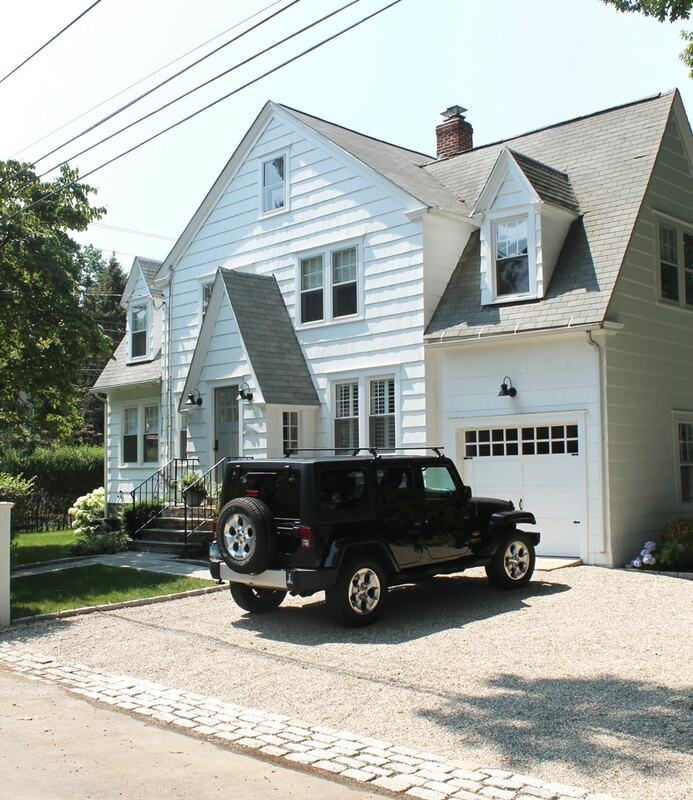 After making the decision to leave their Wilton home that was built in 1860 and had multiple structures on the large property, a lively beach town was just what they were looking for. They wanted a walk-able town with a lot going on. Their new home is close to shopping, beach and the train which makes it possible to have only one car. 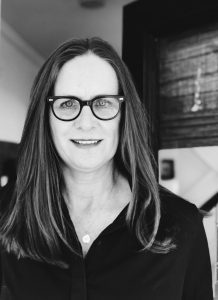 Caitlin says she and her husband constantly say to each other, “best decision ever” about moving to this quaint town. Caitlin is enjoying fixing it up and making it a light airy coastal home. 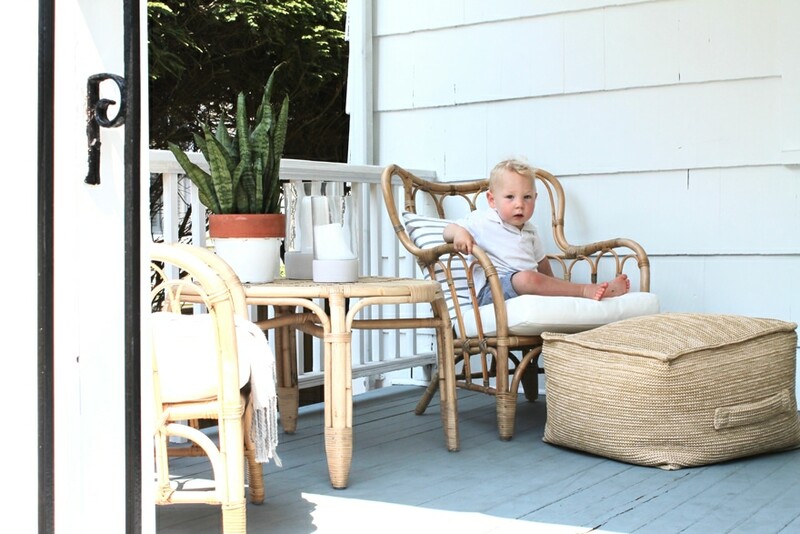 Caitlin used Ikea furniture to spruce up the side porch that’s just off the playroom. 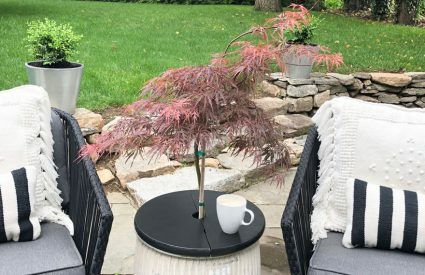 This piece from west elm was purchased for their prior home in Wilton, but fits perfectly in this spot in the living room. 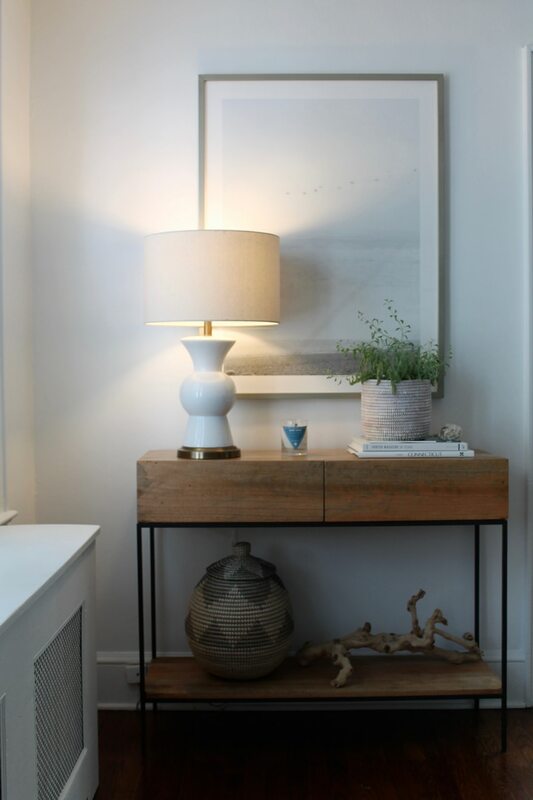 The lamp, basket on the bottom shelf and driftwood are all Home Goods finds. 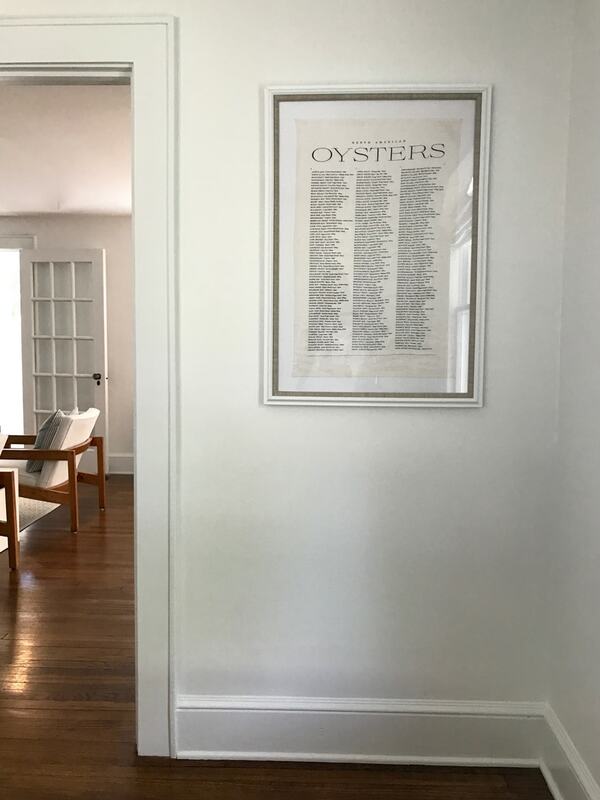 The coastal art above it is from Minted. The candle is from Haus Interior specifically for the release of Nina Freudenberg’s book Surf Shack. The playroom is a bright sunny spot that Caitlin said is about to get a few improvements like built in shelves and drawers to store the boys toys, games and puzzles. 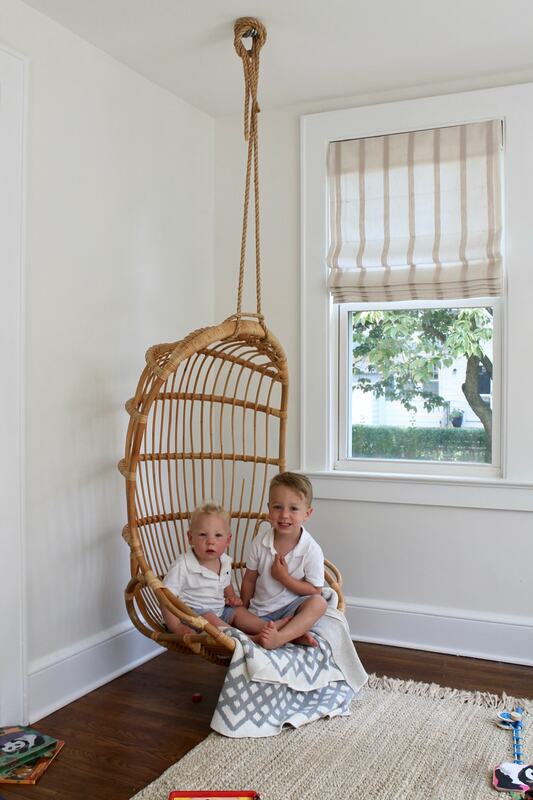 In the corner is everyone’s favorite chair from Serena & Lily. 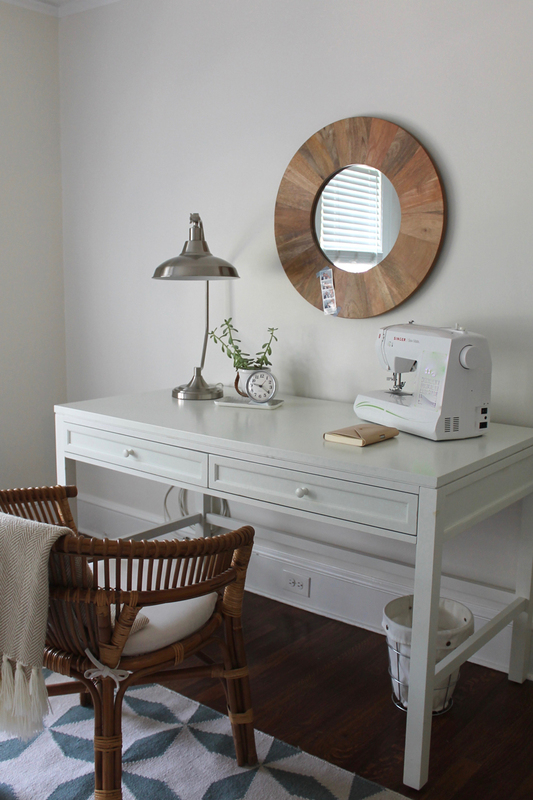 The tiny entryway is where Caitlin and her husband made the best use of space by removing a closet that had a window. Now the entryway is symmetrical with custom made built in benches on each side. 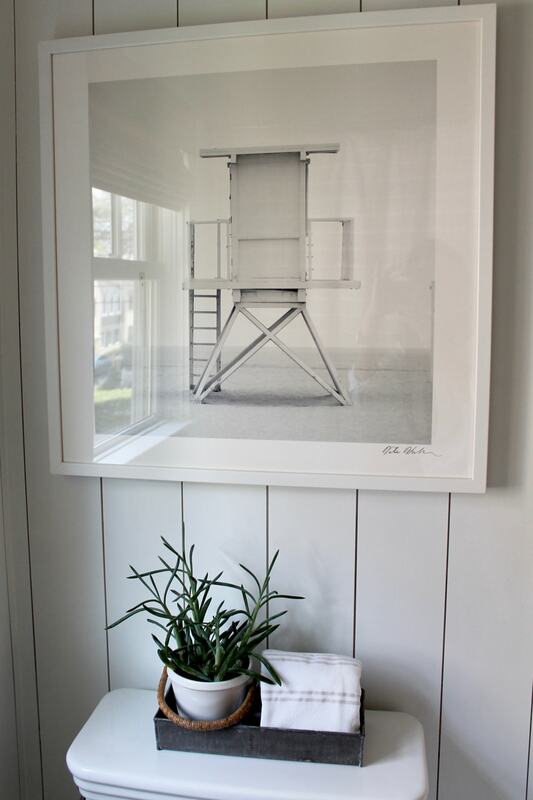 She designed the benches to accommodate the La Jolla baskets that are perfect for storing shoes and boots. 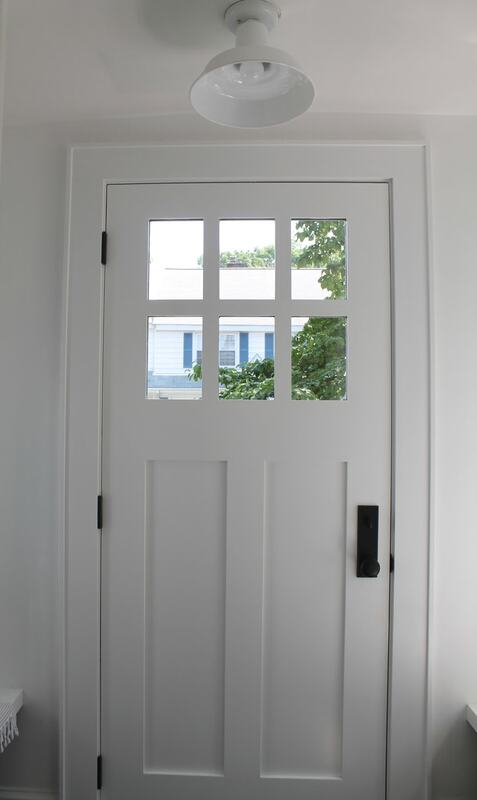 The entry may be small, but the design makes it function beautifully. Windows above each bench and in the new door make it a light bright spot. Their dog Rosie likes to hang out on the bench. 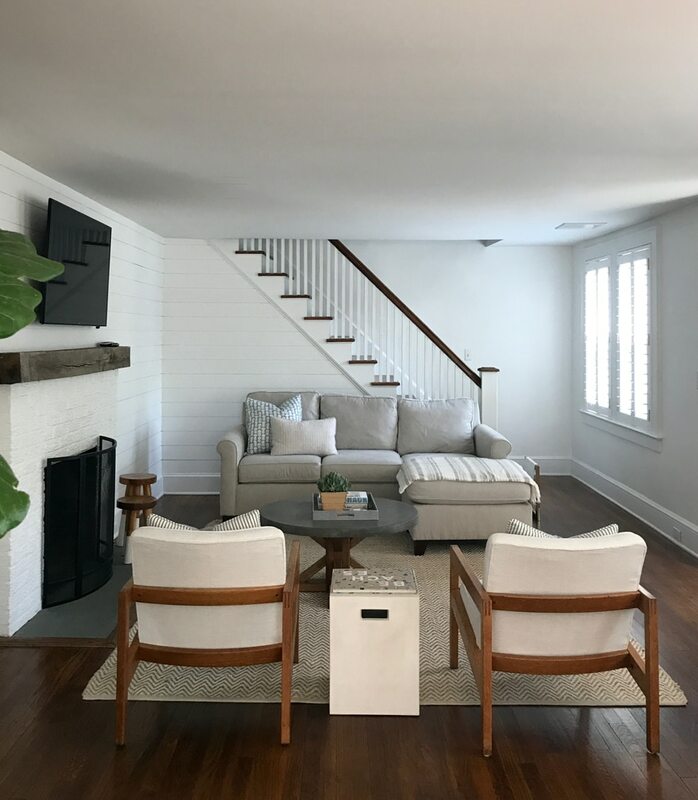 Before moving in they had the living room walls planked and added a fresh coat of paint to the brick fireplace. 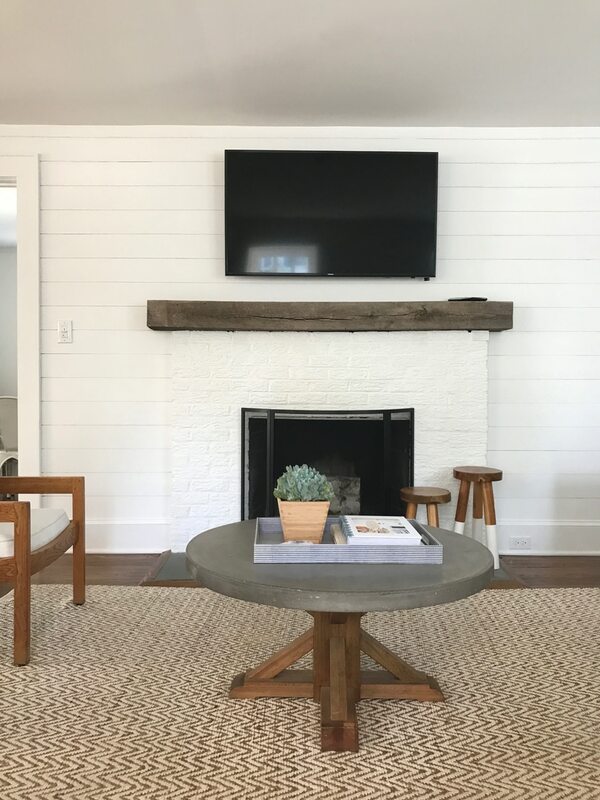 They traded a more traditional mantel for the rustic barn wood plank and added slate to the hearth. The Newbury dining table from Serena & Lily with a salt-washed finish blends beautifully with their chairs. 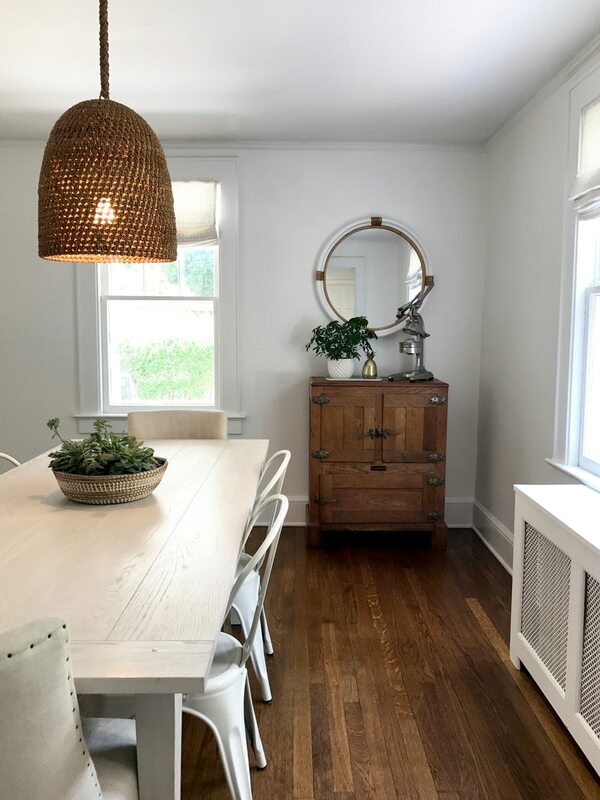 The pendant light from Palecek and the Montara mirror in white and rattan makes this room casual yet sophisticated. 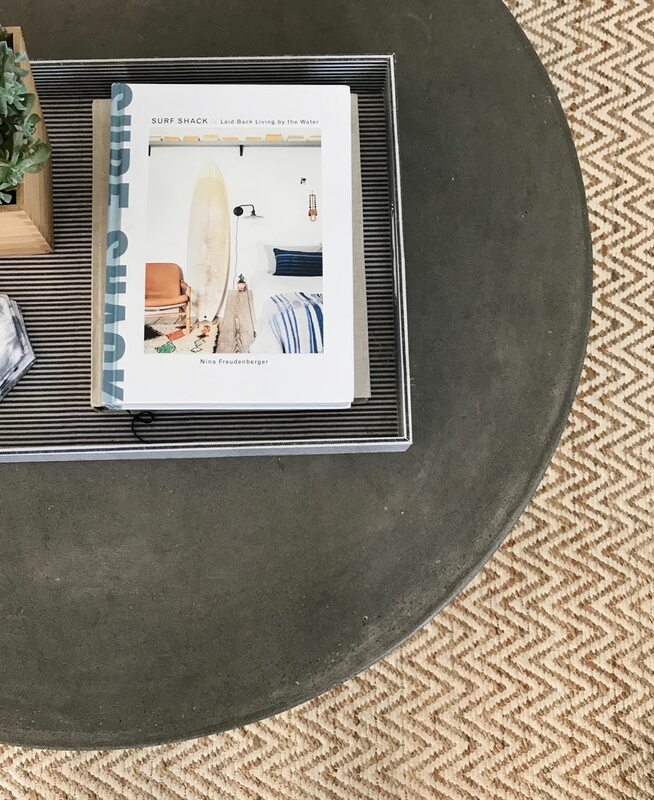 A basket from Home Goods filled with succulents just adds to the coastal vibe. 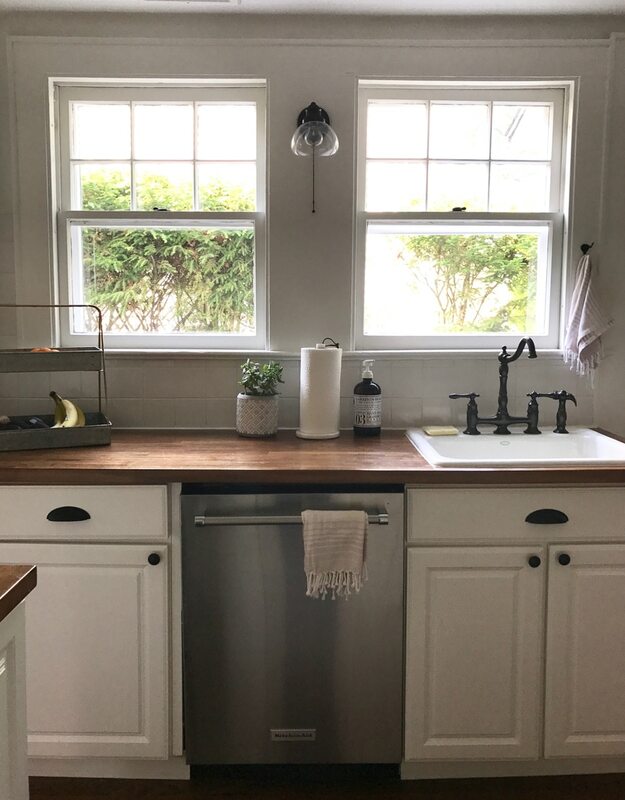 Little details like a tray from Studio McGee with a plant and a brass pineapple next to a Ra Chand juicer adds to the charm. Caitlin says they have big plans for their kitchen but for now they are making it work. 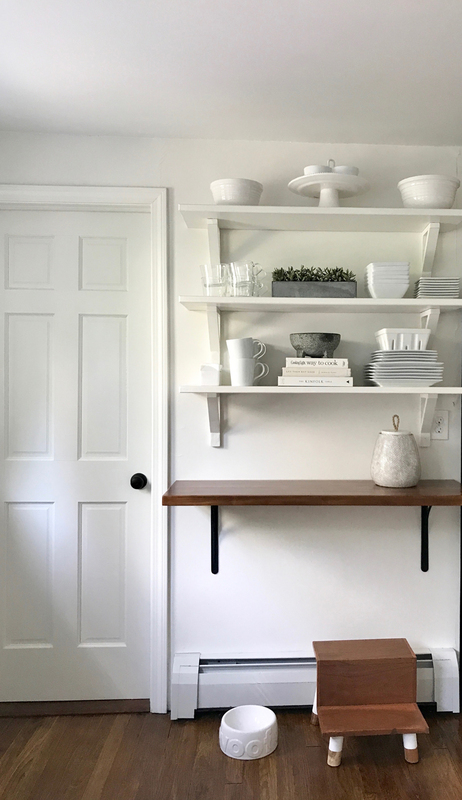 I love how she has used open shelving in a way that’s both practical and beautiful. 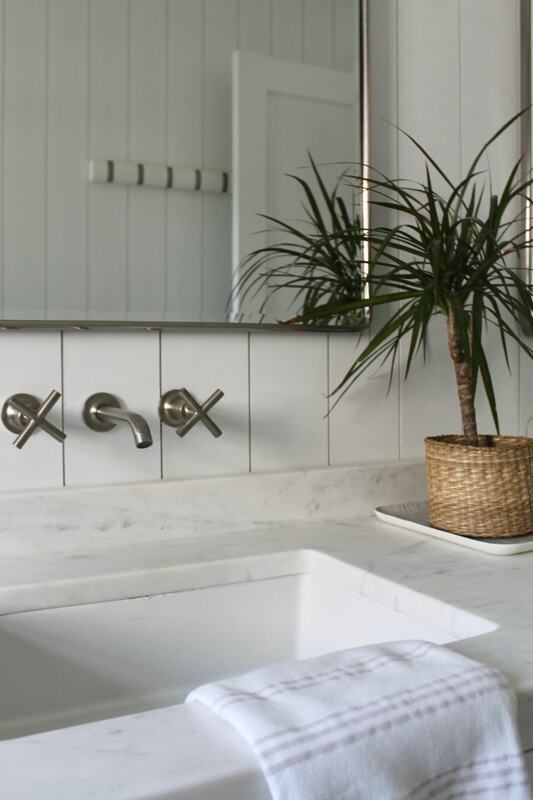 The all white approach makes it feel light and airy and I love how she doesn’t feel the need to fill every surface. The stool sitting next to Rosie’s bowl is perfect for Charlie to get treats for Rosie on his own. The boys currently share a room and it’s seriously so cute. 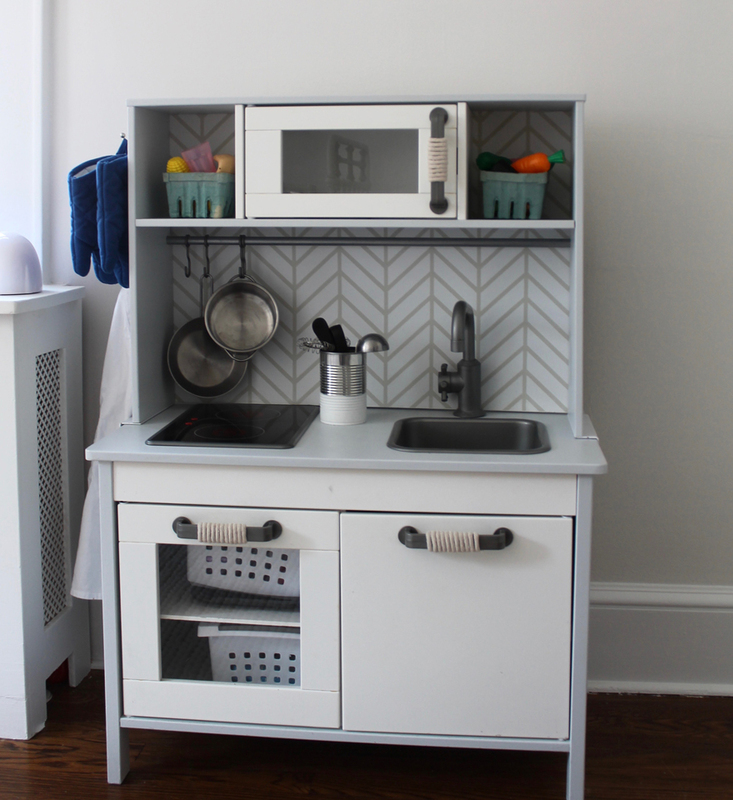 Look at how Caitlin customized the Ikea play kitchen. 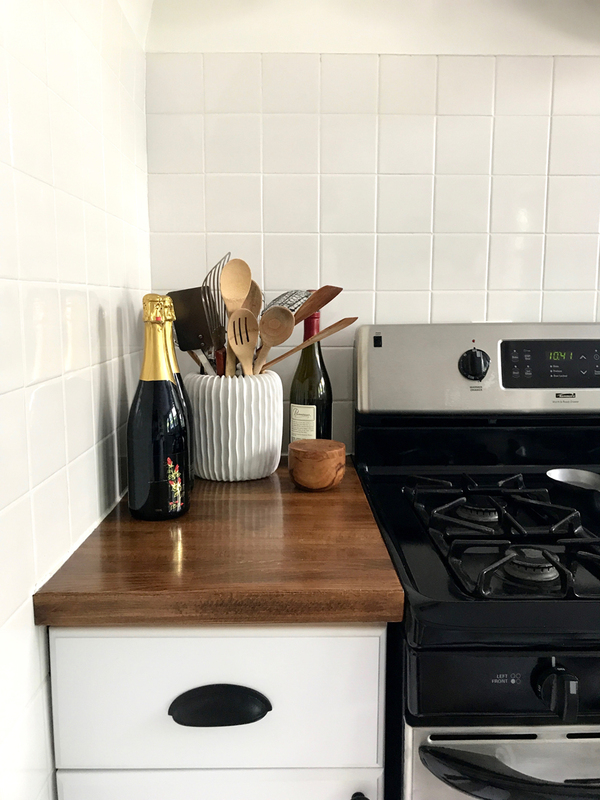 She added rope to the handles, removable wallpaper to the back splash and made a utensil jar out of a can! 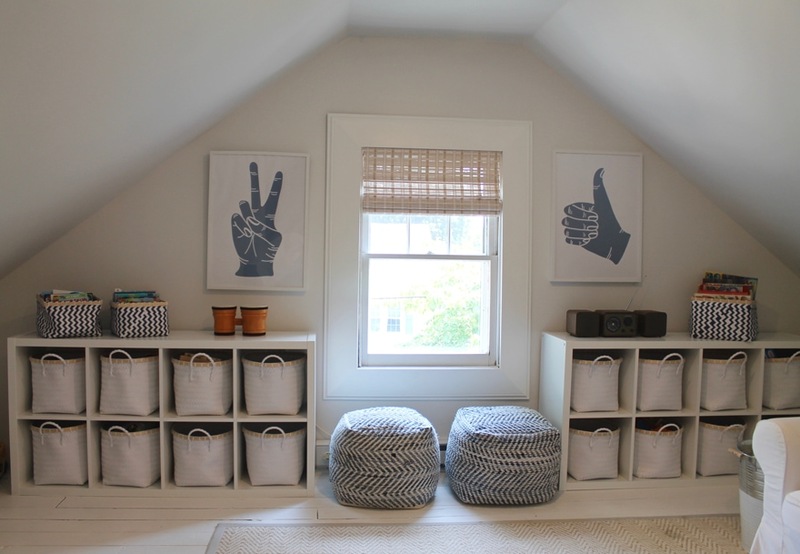 The third floor attic is a cozy place for more play space and toy storage. Seriously, is this not that happiest house? 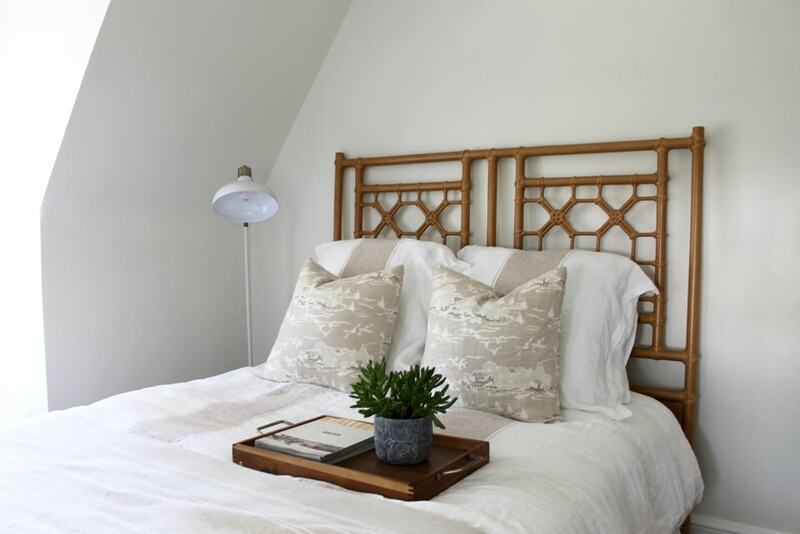 Mixing a little rattan with a lot of white like Caitlin did in her office and the guest room is perfect for the beach cottage look. Caitlin uses trays to add another layer to tabletops and counters. 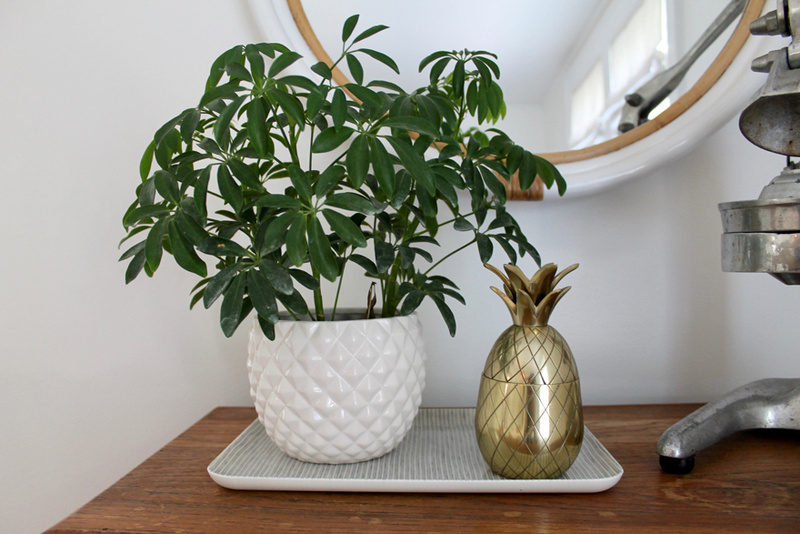 She may use a galvanized tray on the back of a toilet to hold a plant with a wicker handle and on the hard surface of the marble counter she uses trays from Studio McGee and a palm plant in a rattan basket. 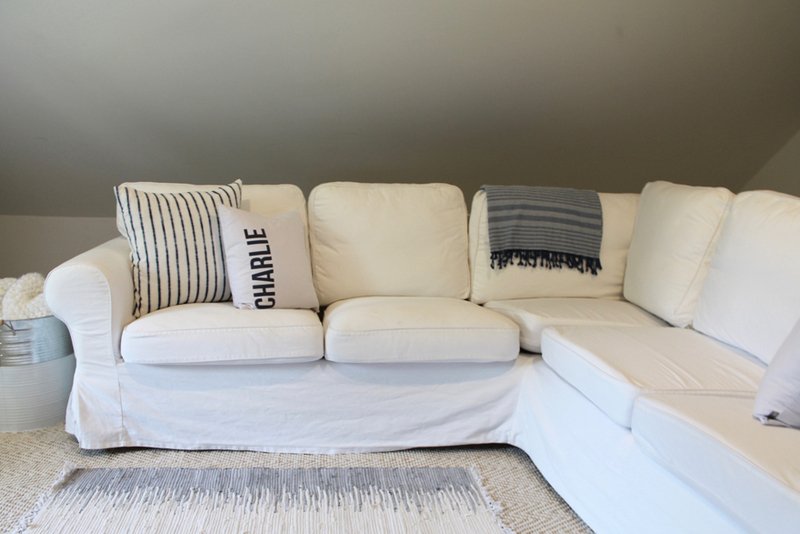 Caitlin and Chris have only lived in their new home for five months and yet have created the light and airy coastal home they wanted for their young family. Thank you Caitlin for your warm hospitality and allowing me to photograph and share your beautiful home! For collaborations, DM Caitlin on her instagram. Dining Room – Pendant – Palecek | Dining Room Table – Serena & Lily | Basket on Table – Home Goods | Side Chairs – Overstock.com | End Chairs – Restoration Hardware | Antique Hutch – Estate Sale | Mirror – Serena & Lily | Oyster Tea Towel in Frame – Shop Nectar, framing at Michaels | Tray – Studio McGee | Ra Chand Juicer – Available on Amazon. 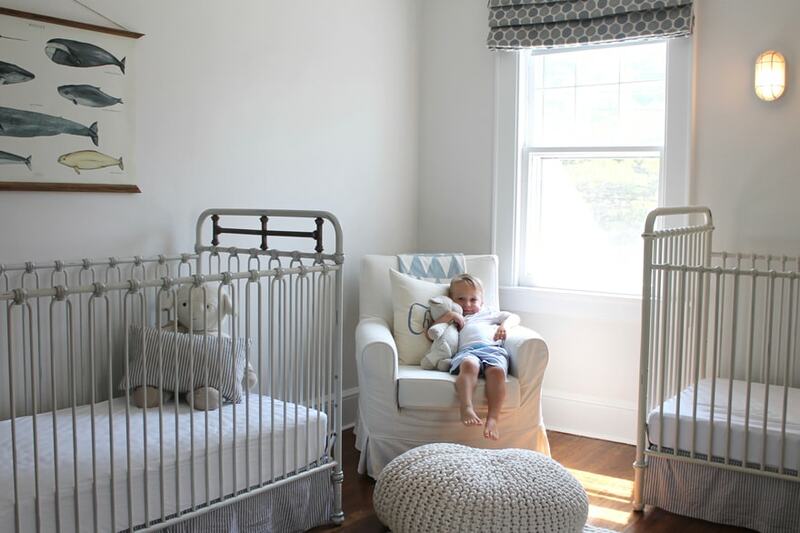 Nursery – Cribs and crib skirts- Restoration Hardware | Wall Hanging – Etsy Arminho | Pouf – Restoration Hardware | Chair – Ikea | Wall Sconces – Home Depot | Window Coverings – Fabric from Calico Corner made by Caitlin’s mom. It’s so clean and crisp! (I am so loving the return of Danish modern in design now.) 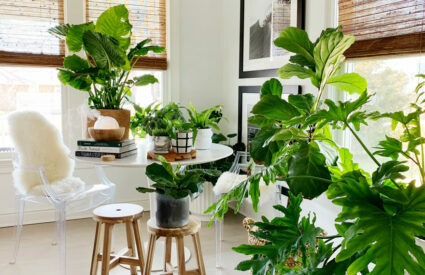 Such a lovely family and a beautiful home. The exterior is amazing, too! Thanks for sharing, Annie. 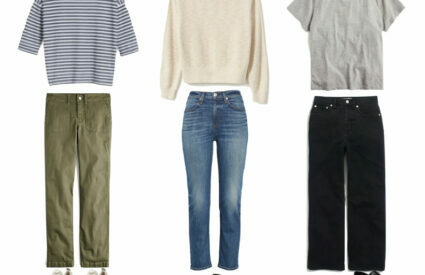 Simplicity at its best! Love!! Thanks Elizabeth! Can’t wait to see you! Wonderful Home! 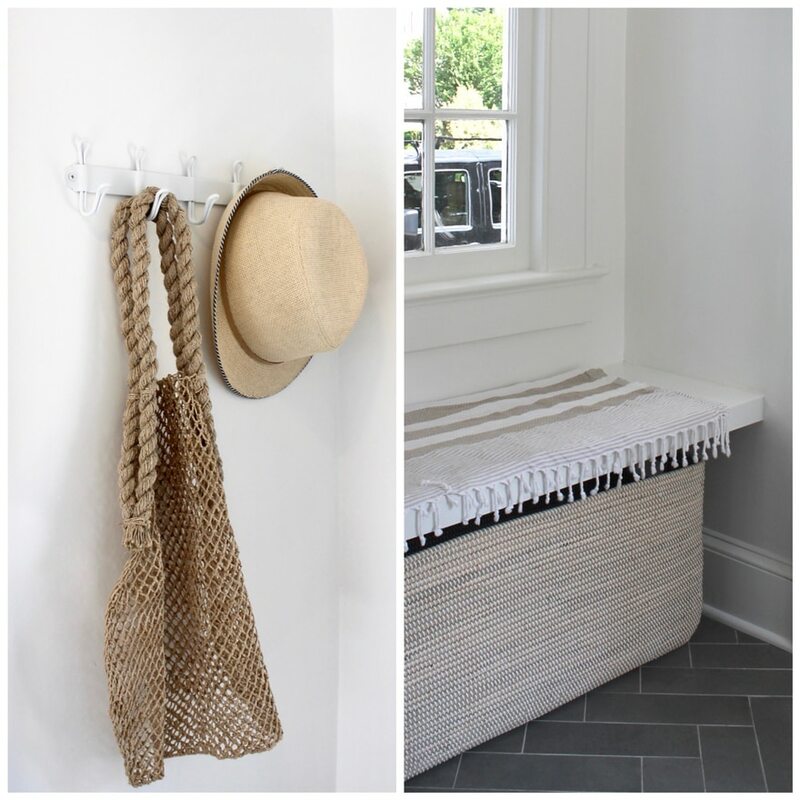 I love the way younger families are choosing a style of living that’s fresh, uncomplicated… minimalist! They see the value in spending more time with the family and other good things in life! You are always so sweet and supportive. Love you! What a perfect blend of coastal and tradition. I love the simplicity of her home. Thanks for sharing Annie! I’m missing your CT/NYC visits! This was a house tour, so I’m not sure what stain she used. I’ll try to find out and will let you know if I am able to determine the stain color.